An interesting study and less steps the better, as we clinical restorative dentists can attest. A clinical trial pitting two 2-bottle adhesives against a 1-bottle adhesive showed them almost equally effective after 3 years, researchers reported at the American Association for Dental Research (AADR) 2012 Annual Meeting here. The head-to-head trial compared 3 products by 3M Espe against each other in noncarious cervical lesions and found a statistical disadvantage for the 1-bottle product only in measurements of margin integrity. "It's just the margins and it's probably because that's where you have the most tension," first author Augusto Robles, DDS, MS, an assistant professor of dentistry at the University of Alabama in Birmingham told Medscape Medical News. Dental adhesive companies have worked for years to reduce the number of steps needed to apply adhesives to restorations by combining etches, primers, and adhesives in 1 bottle. But most research has shown that combining these ingredients results in a weaker bond. Although many trials every year compare dental adhesives with each other, most are done in laboratories and only approximate the conditions under which restorations are meant to stick to teeth. In this study, researchers tried 3 different adhesives, all made by 3M Espe (which provided a grant for the study). 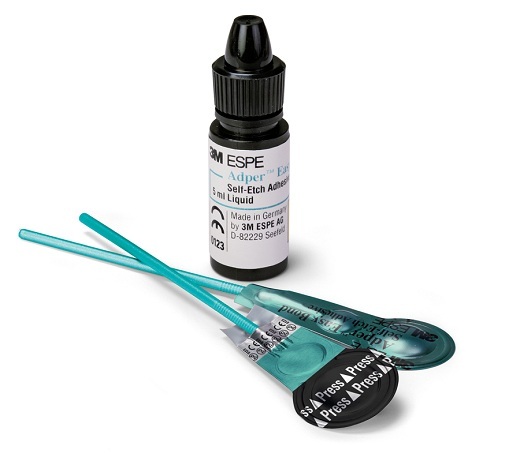 They used the adhesives to place 3M Espe Filtek Supreme Plus composite resin restorations. Adper Single Bond Plus requires 6 steps. Practitioners must etch the tooth surface, rinse, blot, apply adhesive, air, and finally cure. Adper Scotchbond SE also requires 6 steps, but instead of incorporating the primer and adhesive, it incorporates the etchant and adhesive. Practitioners must prime the tooth surface, apply the adhesive, agitate, apply adhesive again, and cure. By contrast, Adper Easy Bond contains etchant, primer, and adhesive in 1 bottle. It requires only 3 steps. Practitioners apply the adhesive, then dry and cure. Many dentists have been reluctant to change their protocols with the newer generation etching products. A lot of restorative dentists would rather invest a little more time during the procedure, than discover in six months that the restoration has either failed in some way or that there is tooth sensitivity. Selection of an etching product may very well be anecdotal rather than evidence-based, but studies such as these may give some dentists incentive to try a new generation of product.